A few nights ago I felt like sewing. 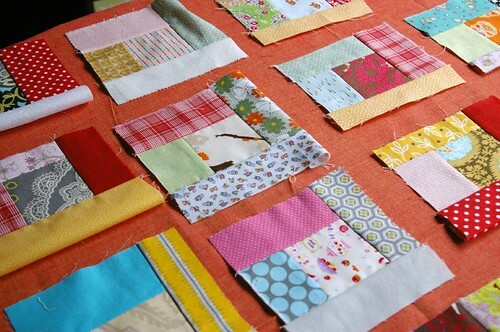 Of course, I did not try to work on my Stacked Coin or my 40 Fat Quarter quilts but decided to start something new! The more WIPs, the merrier, right? I wanted to do something with my smaller charm squares (an assortment of 2″x2″ squares of random fabrics) and my scraps of fabrics. 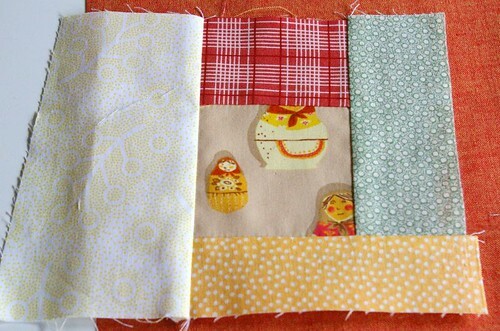 I always love how these look sewn as log cabin blocks so I started sewing. One square, 1 piece of fabric. Sew, trim and on to the next one, without trying to match the colors or anything like that. I knew that even if individually some blocks might look kind of garish, over all they’d work out together. After 2 evenings of sewing I have 46 blocks of various sizes. I will have to trim a bunch down to the smallest size but overall I like the effect. I decided that I’d use one of the fabrics I bought on my way back from Quebec last weekend as the borders around each block. I think that orange works well with the blocks as it pulls from the yellows and reds I used in most blocks. I have to admit that I have no idea when I will get to the next part of the quilt since I have a bunch more box bags to make (I sold quite a few of them already – thank you!) and I have to sew pillow covers for our new couch! 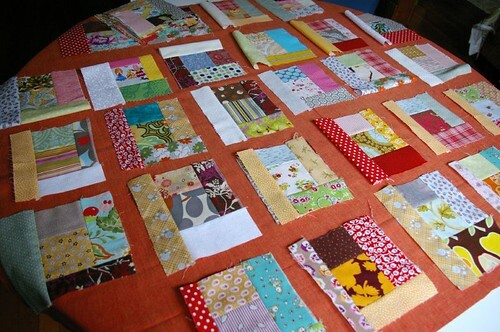 And let’s not remind of the other two quilts I am working on! Wow, you are a sewing fiend now! The log cabin is adorable! I think the orange really makes it. I love these squares. Great fabrics too! it’s sooo nifty! I can’t wait to see the finished look. Wow! That’s going make a great quilt. I like the fabric you’re using for the border too. One of my goals for the new year is to start sewing. I need to make pillow covers too. 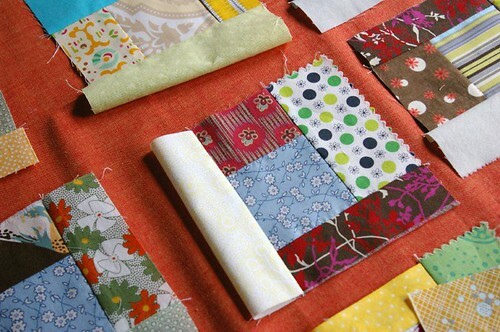 Are you using a pattern or just winging it?